Extreme weather events like those seen in Ireland and countries across the world this summer are increasing as a result of climate change, the World Meteorological Organization has said. Extreme temperatures and associated heatwaves, wildfires and other natural disasters are wreaking havoc from the Arctic Circle all the way to the Sahara Desert, where Africa’s highest ever reliable temperature reading of 51.3 degrees was recorded recently. In California, at least six people have died and thousands more have fled their homes as wildfires continue to surge through the State. 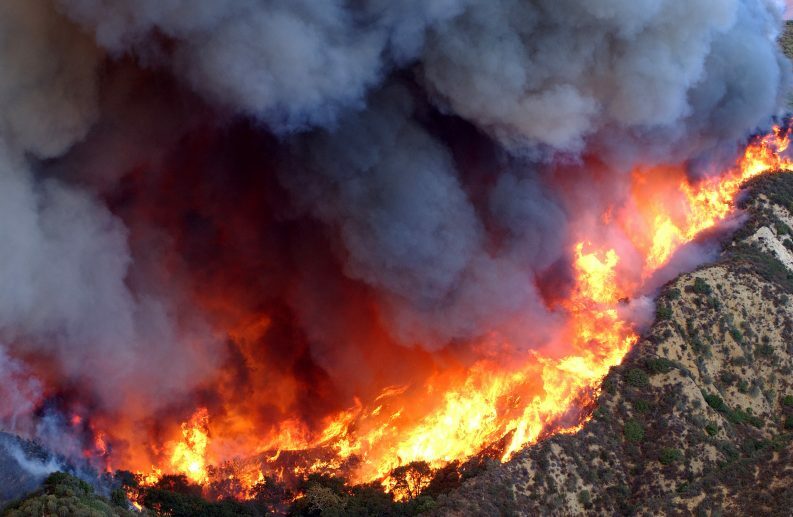 The fires come after parts of Southern California reached the hottest readings ever recorded there in early July. Europe also saw heavy flooding this summer, including record rainfall in Paris, and major disruptions in Spain, Slovakia, and Greece, among other countries. Such extreme weather event in the first half of 2018 have had “widespread impacts on human health, agriculture, ecosystems, and infrastructure”, the WMO said in a statement yesterday. This year is now shaping up to be “one of the hottest years on record” according to WMO Deputy Secretary-General Elena Manaenkova and comes as “no surprise” to the international institution. Almost two-thirds of 131 studies in the Bulletin of the American Meteorological Society between 2011 and 2016 found that the probability of the extreme event occurring increased due to anthropogenic activities, in some cases by a factor of ten or more. 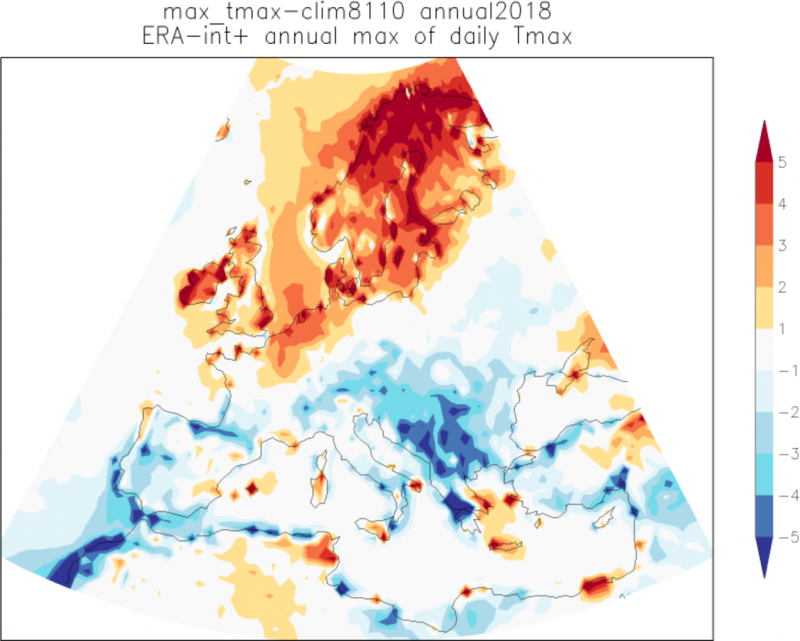 Findings released last week by the World Weather Attribution network (WWA) shows that the abnormally dry conditions across Europe may become the summer norm in the near future. The hottest 3-day average of Tmax in 2018 (ECMWF analyses up to 24 July, forecasts up to 31 July) compared to the highest 3-day maximum temperature in the period 1981-2010 that is currently the “normal” period (ERA-interim). The WWA compared real-time current temperature data with historical records at seven weather stations in northern Europe, including one location in the Phoenix Park, Co Dublin. According to the WMO, Ireland recorded heatwaves – five consecutive days or more with maximum temperature over 25°C – at 15 stations and an absolute drought at all of its stations. Northern Ireland recorded its hottest June on record and the thermometer at Shannon Airport hit 32 degrees, the highest June temperature recorded in the Republic since 1976. While Met Éireann said that it is “not possible” to attribute the individual extreme events of June and July to climate change, they are “compatible with the general long-term trend due to rising concentrations of greenhouse gases”. The national forecaster has come under criticism recently for allegedly failing to inform the Irish public about the impact of climate change on weather patterns on the island. “There is no simple yes or no answer to the question,” Met Éireann said in a new report released yesterday. Both Met Éireann and University College Cork are currently involved in two separate projects to assess the influence of anthropogenic climate change on Irish weather extremes. The heatwave has had a dramatic impact on the vast majority of the farming community who rely on rainfall for grass and crop growth. For livestock farmers, the dry weather and soil moisture are impacting grass growths rates, leaving many farmers with no choice but to start using their supplies of hay to feed animals now. This comes on the back of the fodder crisis at the start of the year as cattle endured longer stays indoors following a wet winter which also impacted grass and crop growth. Grain growers are facing an equally difficult situation as winter crops, already stressed by the major snowfall earlier this year, were impacted by excessive heat and drought conditions. Many winter crops were harvested up to a month earlier than usual. The drought also had an impact on the number of wildfires across Ireland this summer. Based on an analysis of data from fire services across the country, The Green News found that firefighters have attended at least 2,257 bog, gorse, grass, and forest fires since the start of June alone. The average annual number of fire incidents between 2000 and 2016 stands at just over 3,400. Several fire brigades told The Green News of increased “fatigue” and “exposure to risk” among their staff, as well the fires putting an additional demand on resources. Fire outbreaks in Donegal, for example, meant that the fire service was “not immediately available” to respond to requests for assistance where there is a “risk to life such as road traffic collisions”, a council spokesperson said.